Bladder sludge. Bladder stones. Hypercalciuria. Urolithiasis. Whichever term you may be familiar with, they all describe one of the most common heath concerns facing our little critters, especially rabbits and guinea pigs. But why do some animals develop bladder sludge? The short (and frustrating) answer is no one is completely sure why some animals are so predisposed to this issue. What contributes to bladder sludge? So, what are the factors that contribute to the production of bladder sludge? Many have adopted the “calcium hypothesis” which proposes that high dietary calcium is at the root of the issue. The hypothesis has merit when considering that rabbits and guinea pigs (unlike humans and most other species) cannot adequately control their calcium absorption. In humans and other species, the body absorbs enough calcium to maintain healthy blood calcium levels and excretes the excess. Bladder stones and other issues related to excessive calcium can still occur in non-rabbit and guinea pig species, but they are rarer in comparison. What’s different about rabbits and guinea pigs? Rabbits will absorb nearly all of the calcium they consume and guinea pigs are thought to absorb a significant portion of dietary calcium as well. Excess calcium is then filtered through the kidneys and excreted in the urine. But the kidneys can only take so much before they can’t filter any more. When this happens, the calcium forms a solid crystal which gets excreted through the urine, producing a cloudy sludge. If calcium can lead to bladder sludge in my rabbit or guinea pig, should I just avoid it altogether? Adequate dietary calcium is essential for strong bones and teeth. If your rabbit or guinea pig’s diet is deficient in calcium, the body will pull the calcium it needs from stores in the bones. When this happens, it makes bones weak and prone to fracture or break. Calcium is also required for strong, healthy teeth; if the diet contains too little calcium, the body will preferentially use that calcium for other physiological processes over tooth maintenance. This can cause the teeth to get weak and loosen or break. For rabbits and guinea pigs (whose teeth grow continuously throughout their lives) receiving adequate calcium via the diet is especially important. How do I know if my rabbit or guinea pig develop bladder sludge? Another hypothesis is that some animals are genetically predisposed to developing bladder sludge. Dried sludge on the hindquarters. 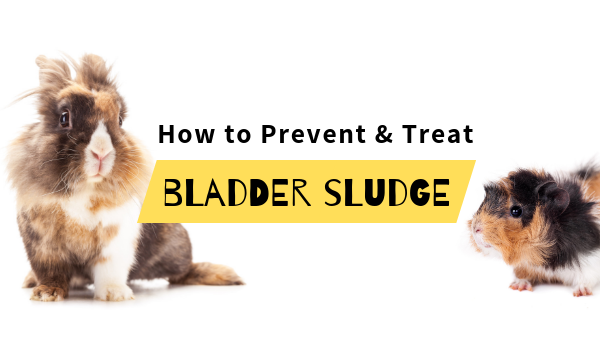 No matter the reason for development of bladder sludge, there are some proactive steps you can take to help your beloved rabbit or guinea pig avoid this painful and unpleasant condition. Be sure to work with your trusted veterinarian to formulate a health and nutrition plan that meet’s your pet’s specific needs before making any changes to your pet’s daily routine. What can I do to prevent/treat bladder sludge? Increase water intake. An increase in water consumption dilutes the urine and helps prevent the formation of stones, while also helping flush out the kidneys to reduce stress. Make sure both a bottle and tip-proof water dish are available at all times to encourage drinking. Include these vessels in both the habitat and any other areas where they exercise or explore throughout the day. It is also important to ensure all bottles are properly positioned and functioning properly. Replace with fresh water no less than every other day. More exercise. Get your pets up and moving! The more your rabbit or guinea pig moves, the more they shake up the contents of their bladder. This moves the high calcium urinary sediment around, helping prevent stone formation. Movement may also stimulate a desire to empty the bladder more regularly. Improve sanitary conditions and enclosure. Use a high-quality, absorbent bedding that wicks urine and other fluids away. A clean enclosure will promote healthy urination and keep things moving to prevent stone formation. At minimum, spot clean enclosures every other day and deep clean once a week. If possible, provide a multi-level enclosure, or one that promotes movement. This will help increase activity (see #2). Increase fresh green intake to upwards of 15-20% of their diet. Be sure to do this slowly and monitor your animal to ensure they are tolerating the dietary change. Really focus on the low calcium greens (http://rabbit.org/suggested-vegetables-and-fruits-for-a-rabbit-diet/) with smaller amounts of veggies and even less fruit. The fresh greens can increase water intake (see #1) as well as provide vitamins, minerals (other than calcium), and phytonutrients to promote a healthy and properly functioning urinary tract. Eliminate packaged treats. Packaged treats provide concentrated little nuggets of nutrients, which may not be beneficial for animals with bladder sludge. The increase in greens (above) will be their new treat. Offer a variety of grass hays and eliminate alfalfa from the diet. Alfalfa hay is great for some animals; however, it contains much higher concentrations of calcium and may exacerbate bladder stone issues in some animals. Rotating your grass hay offering will also provide some enrichment and discourages picky eating by keeping your pet excited about their hay. Offer a grass hay-based pellet at recommended daily feeding amounts. You can also consult with your veterinarian to see if reducing the amount of offered pellets may be right for your animal. Reducing the volume of pellets and offering an increase of loose grass hay and greens will dilute dietary mineral concentrations and may help reduce strain on the kidneys. Glucosamine (plant-based) to support the replenishment of mucous that lines and protects the bladder. Marshmallow root and dandelion leaf which are natural diuretics to reduce water retention and promote urination. Astragalus root which acts as an anti-inflammatory and antioxidant to protect kidneys from oxidative damage and support renal function. Cranberry which is an antimicrobial that helps prevent urinary tract infections. Pumpkin seed to help relieve spasms and cramping from urinary disorders. In some cases, you cannot prevent the development of bladder sludge. However, implementing some of the above actions can help to reduce your animal’s chance of stones or provide relief to an animal with stones. Have a Question That You’d Like to Ask Us About Urinary or Digestive Health? How can I provide my pet with additional urinary health support? Should I contact my vet if there's blood in my guinea pig's urine? Should I contact my vet if there's blood in my rabbit's urine?